Phuket (ภูเก็ต) is an island province in the south of Thailand within the Andaman Sea. While many people think of Phuket (ภูเก็ต) for its world famous beaches and relaxing resorts, when I think about Phuket, as you probably can already guess, I think about the food and restaurants. In Phuket you’ll find marvelous southern Thai food, Malay food, Chinese food, and even Indian food. The island is also blessed with access to an abundance of tropical fruits and vegetables and fresh seafood. Additionally, Phuket is one of Thailand’s most vegetarian friendly destinations, so if you’re vegetarian, you’ll have lots to choose from. However, in the major beach towns and villages, unfortunately there’s not a lot of local Phuket cuisine available, and most restaurants are overpriced and sub-standard. But the good news is, within Phuket Town, there is some amazing local Phuket restaurants and food, so most of what I’ve covered here on this page, are restaurants concentrated in and around Phuket town. So for the best food and Phuket restaurants, it’s best to spend sometime in Phuket town. 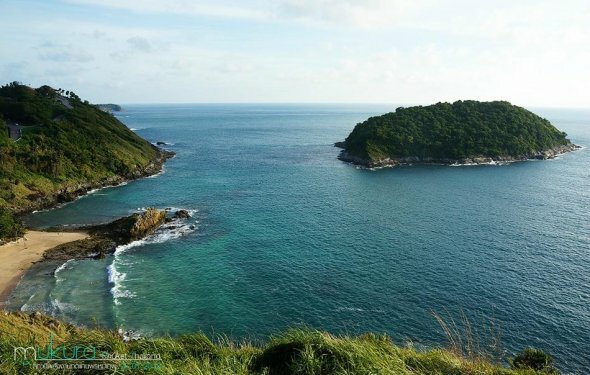 Even if you’re just taking a holiday for a few days to Phuket and want to get as much beach-time in as possible, if you want to eat local Phuket cuisine, definitely spend some time exploring Phuket. Lock Tien (ลกเที้ยน) is a famous restaurant in Phuket, and many Thais from Bangkok that visit, would consider this place a must-eat. The restaurant is sort of like a semi-indoor food court, with a variety of permanent food carts set up around the court serving different dishes. You still order off a menu, and once you place your order, each vendor will deliver you your food. The most famous food to eat at Lock Tien (ลกเที้ยน) is mee leung pad Hokkien sai kai (หมี่เหลืองผัดฮกเกี้ยนใส่ใข่), yellow noodles fried up the Hokkien way with an egg on top. The noodles were smoky and salty, and the egg provided and extra kick of richness. I thought it was an awesome bowl of noodles in Phuket. Located right within the old town portion of Phuket, Yoy Pochana (ร้านย้อยโภชนา) is one of the many classic Thai Chinese Phuket restaurants that serves both authentic Teochew style dishes and Chinese dishes mixed with southern Thai ingredients and flavors. Probably my favorite dish I ordered was the goong pad sauce makam (กุ้งผัดซอสมะขาม), succulent shrimp stir fried with tangy tamarind sauce. I loved everything about this restaurant from the food to the no-frills atmosphere, to its peaceful location within old town Phuket. My wife Ying told me we needed to check out this restaurant knowing it was going to be a place I was going to love. She’s always right. Hong Khao Tom Pla (ฮ้องข้าวต้มปลา) is a Thai Chinese restaurant that has some serious character – it’s the type of restaurant were the chef yells commands to his staff, always a loud and action packed environment. When we ate their, we tried to order some of their specialities, including tom yum pla nam sai (ต้มยำปลาน้ำใส), which was different and very unique, and probably my favorite dish of this restaurant in Phuket, talay pad pongari (ทะเลผัดผงกะหรี่), a mix of seafood in yellow curry with egg. All the food was delicious, and I loved the environment and action packed atmosphere as well. Located right across the street from the big morning Kaset Market (below) is a Thai Halal restaurant called Krua Charifa (ครัวชารีฟ๊ะฮ์) that specializes in Thai and Malay food. It’s a khao gaeng (rice and curry) restaurant, so as soon as you arrive, you’ll be able to pick and choose which dishes to order. One of the best dishes I ate at Krua Charifa (ครัวชารีฟ๊ะฮ์) was gaeng gari pla (แกงกะหรี่ปลา), a Malay style fish curry that was teeming with spices, and flavored with curry leaves. Also, don’t miss the Phuket salad (Yam Phuket (ยำภูเก็ต) that includes a good mixture of green mango, coconut, and dried fish. 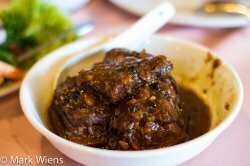 Krua Charifa (ครัวชารีฟ๊ะฮ์) is one of my favorite restaurants for local Malay food in Phuket. This place is also Halal.